“Open your eyes, America, and see that water is in danger in your own backyard,” a Sioux elder says. 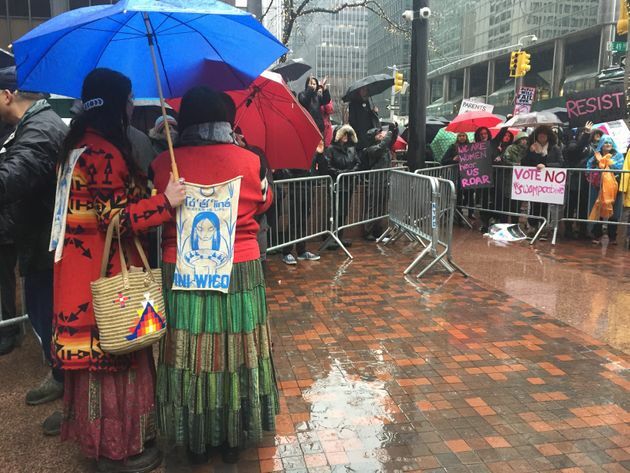 Native : NEW YORK ― A frigid rain fell hard on Cheryl Angel and her fellow protesters Tuesday, but she would not be moved. The 56-year-old activist and elder of the Rosebud Sioux Tribe braved far worse weather while living for months on the Standing Rock Indian Reservation in North Dakota, where she fought to stop the Dakota Access Pipeline from being buried under the sacred waters of Lake Oahe. She had joined hundreds outside the New York offices of Sens. Chuck Schumer (D-N.Y.) and Kirsten Gillibrand (D-N.Y.) to urge them to vote against President Donald Trump’s controversial slate of nominees. But she had a hunch that the fight over the 1,172-mile pipeline wasn’t over. Cheryl Angel, 56, is prepared to continue fighting against the Dakota Access Pipeline despite Trump’s Tuesday memorandum. That attack resumed Tuesday when Trump signed a flurry of executive actions meant to jump-start stalled construction on the pipeline and invite TransCanada, the company behind the controversial Keystone XL, to reapply to build the pipeline rejected by his predecessor in 2015. Native American leaders quickly announced plans Tuesday afternoon to fight the executive actions, particularly the one granting permission to complete construction on the Dakota Access Pipeline. The oil conduit has been stalled since December, when the U.S. Army Corps of Engineers denied a permit to lay the final stretch of the $3.8 billion project’s pipe under Lake Oahe, a water source sacred to the Standing Rock Sioux. The halt, issued under former President Barack Obama and hailed as a victory by protesters, may be undone by the new executive orders. 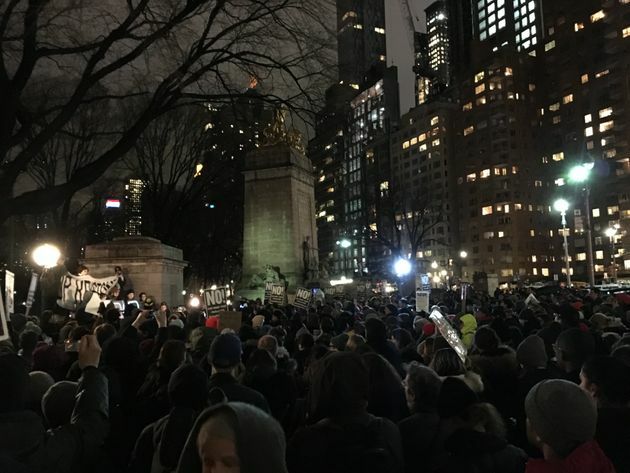 Hours after the president’s announcement, hundreds of protesters swarmed Columbus Circle in New York City. Loud chants of “If all lives matter, Native lives matter!” and “Keep it in the soil, you can’t drink oil!” echoed in the park. Hundreds of protestors rallied in opposition to President Donald Trump’s new order. The event was hosted by a number of grassroots organizations urging those who care about the planet to show their opposition to Trump’s new order. Rosemary Faulkner, 78, got news of the protest from a friend’s email and made a sign “very quickly” for the occasion, she said. Faulkner said the country needs to have a sharper focus on renewable energy. Jed Holtz, a 34-year-old organizer with the Freedom Socialist Party, said it’s time to call for larger change in protecting clean water. “It’s going to take a much bigger galvanization of working-class people across race lines to stop these attacks [on the environment] from happening,” Holtz said. Thousands of protesters ― including 2,000 veterans who came to serve as “human shields” ― descended on Standing Rock last year as security forces battled demonstrators with attack dogs, tear gas and fire hoses sprayed in frigid temperatures. But don’t expect mass demonstrations to block Trump’s order. 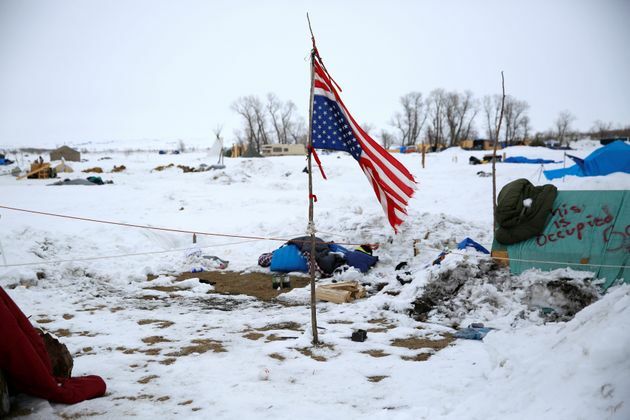 On Friday, the Standing Rock Sioux Tribal Council voted unanimously to approve a resolution asking protesters to leave their sprawling encampment by the end of the month. Demonstrators intent on maintaining a physical presence were offered an alternative site on higher ground nearby on the Standing Rock Reservation to carry on their resistance, a tribal spokeswoman, Sue Evans, told HuffPost. The tribe plans to take its fight to the courts. A weathered, inverted America flag catches the wind at the Dakota Access Pipeline protest camp near Cannon Ball, North Dakota, on Jan. 24, 2017. John Linstrom, a 29-year-old student at New York University, said he came to Tuesday’s protest to stand up for the water protectors. “I think we need to respect what the indigenous leaders at Standing Rock are asking of us,” Linstrom said about the unanimous decision to send protestors away. Still, he said if protests do start up again, he’d be willing to “risk arrest” by going to Standing Rock. The action on the Dakota Access Pipeline is not technically an executive order, according to lawyers for Earthjustice, the legal nonprofit representing the Standing Rock Sioux. Rather, the document is a memorandum ordering the U.S. Army Corps of Engineers to complete the permitting process “to the extent allowed under law.” The law already requires the Army to conduct a full environmental impact statement (EIS) and consider alternative routes, the group said. For protesters who are already dug in around the Standing Rock camp, Trump’s orders served as a new call to arms. Medic + Healer Council, the group that ran clinics at the protests, recirculated its request for volunteers Tuesday after the orders were signed. Angel sees the future of the fight on an even broader scale. She said it’s critical for the U.S. to wean off fossil fuels and prevent further environmental hazards from pipelines that leak into major rivers and endanger the drinking water of communities. As if by eerie coincidence, a pipeline in the Canadian province of Saskatchewan leaked 52,834 gallons of oil on aboriginal lands Monday, less than 24 hours before Trump signed the new executive orders. Trump’s efforts to increase pipeline infrastructure are undoubtedly a significant setback for “water protectors” across the country, but Angel is prepared to resume the fight. 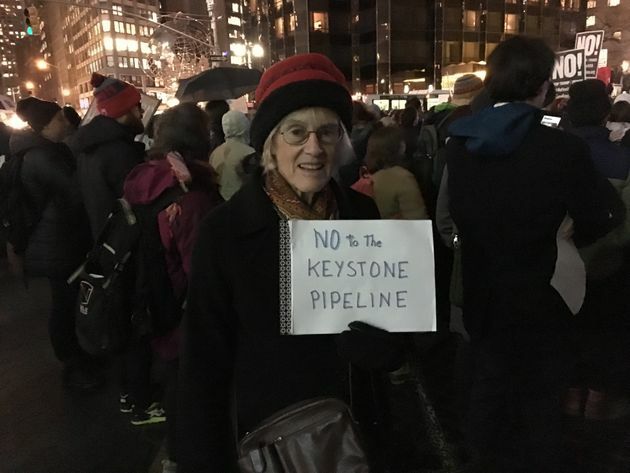 She’s confident the American people can halt pipeline construction once and for all. Michael McLaughlin and Sebastian Murdock contributed reporting. “Open your eyes, America, and see that water is in danger in your own backyard,” Angel told HuffPost.